Plan on tying the knot soon? You might consider doing what more than 20,000 couples did last year-get married in the Great Smoky Mountains of Tennessee. After all, Pigeon Forge, Sevierville and Gatlinburg are collectively known as the Wedding Capital of the South. Considering the beauty and majesty of the Smokies as a scenic backdrop, it's no wonder that love-struck couples from all over the world flock here each year to exchange vows and spend their honeymoons. You'll find all kinds of wedding destinations in the communities of Sevier County. Some folks still prefer traditional church weddings, but in recent years, more and more couples have said, "I do" in the dozens of area chapels that specialize in complete wedding-day packages. Options can range from short-and-simple ceremonies with just a few guests to large-scale affairs complete with catering, photography and honeymoon accommodations. Wedding caterers include: Great Smoky Mountain Catering Company, All Occasion Catering, and Smash Events Catering & Event Planning. A must for medium to large weddings, these companies will provide all the food and beverages for your big event. A chapel wedding can be attractive to prospective married couples for a number of reasons. For one, they are often less expensive than large church weddings, and they can be planned more easily and in a shorter period of time. One of the most appealing aspects of a chapel wedding is the fact that all of the elements of the event can be coordinated centrally, in a cooperative effort between the couple and the chapel's staff. Admittedly, when one hears the term "wedding chapel," images of the cheesy glitz of Las Vegas may come to mind. But don't worry; none of the local chapels is the quickie-marriage type of operation where you'll be hitched in less than ten minutes by an Elvis clone that hands out casino chips as a gift. Yes, you can get married in a relatively short period of time, but most wedding vendors you'll find are established, reputable businesses with tasteful, attractive facilities. The choice of ceremonial backdrops also covers a lot of ground, from wooded gazebos to waterfalls to mountaintops. But that's just the start. Other types of businesses-like attractions, restaurants and vacation lodgings-have carved out their own niches in the wedding market here, offering one-of-a-kind settings for couples looking for a unique ceremony alternative. You can even get married in a helicopter or on horseback if you want! Naturally, if you're getting married in the Smokies, you might as well stick around town for the honeymoon, right? Why mess with air travel when you can go from your wedding ceremony to your love nest in just minutes? Whether you're interested in Pigeon Forge cabins or hotels in Gatlinburg, you'll find the ideal spot to start your life as a married couple. 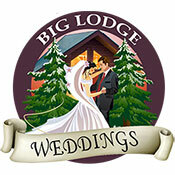 With enough space to house your entire wedding party (and then some), plus your own private wedding chapel on site, few Smoky Mountain wedding destination venues hold the enormous appeal of Big Lodge Weddings. This luxurious main house is the center of a large campus that includes an indoor pool and more. Plan your Smoky Mountain wedding at this resort for your own happily ever after. They don't call the Great Smoky Mountains the Wedding Capital of the South for nothing. 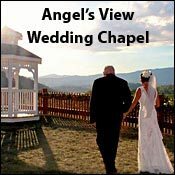 And at Angel's View Wedding Chapel, we have everything you need to make your Smoky Mountain wedding the special event you've always dreamed of. We start with our number one asset-stunning, panoramic mountain views-and then offer a wide array of services and amenities designed to help you create your vision of your big day. We take care of all the details, including location, ceremony, minister, music, salon services, massage, make-up, reception, photography and videography, wedding cakes and limo service. It's all handled in house, making your wedding-day preparations as stress-free as possible. Give us a ring today at 800-758-6604. Weddings and Vow Renewals can be performed at your cabin, resort or in one of several outdoor locations including the Great Smoky Mountains National Park. Weddings are performed by an ordained minister. You must reserve a time with the minister. We will contact you after you make your reservation to confirm all details. No waiting period is required, but a Tennessee Marriage License is required. We will give you all the details when you call (contact information will be provided on the E-Ticket, after reservation is complete). We offer photography as well as other additional services to make your day complete.